Sonic the Comic 1 is the first issue of the Sonic the Comic series by Fleetway. 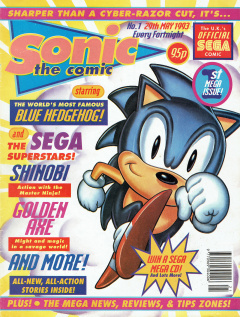 This issue contained three comics; a main Sonic story followed by two shorter strips based on other SEGA franchises: Shinobi and Golden Axe. Control Zone: Introduction of the issue and staff details. It also includes 'The SEGA Charts', which lists the top ten sales for games on SEGA consoles (Mega Drive, Master System and Game Gear). Review Zone: Games from current SEGA platforms reviewed on a % scale. News Zone: Information on upcoming SEGA events and products. This issue featured the seconds models of the Mega Drive and Mega CD, previews of Jungle Strike and B.O.B. ], and advertised the Sonic Gamebooks. Q Zone: Cheats, Game Genie codes and strategies for popular or requested games. Speedlines: Reader-submitted letters, with replies from Megadroid, the comic's mascot character. Sonic's stories were roughly based around the events from the Mega Drive games Sonic 1 and Sonic 2, a promotional comic and both the 1991 & 1992 Sonic the Hedgehog Yearbooks. The stories were aimed at the 5 - 10 year-old market, and thus were kept simple and within a 'floating timeline' (ie. The editors did not allow multipart or plot-altering stories). It would take until issue 008 for the Sonic stories to go beyond this rule and evolve into the story format it would be remembered for. 1.1 Sonic the Hedgehog - "Enter: Sonic"
Sonic the Hedgehog - "Enter: Sonic"
As Sonic dashes around the Green Hill Zone, freeing his friends from their Badnik prisons, Dr. Robotnik (shoehorning an average of one egg-related pun into every page he's on) finalises the production of his 'Neutrino Accelerator' machine, which runs indefinitely on Golden Rings and is designed to deliberately pollute Mobius' atmosphere and crush Sonic permanently. The animals being freed from the Badniks warn Sonic about the machine, but he rushes on regardless. After dodging various Badniks and environmental hazards, Sonic finds and rescues Porker Lewis (at this stage he resembled Picky from the games). Catching up to Robotnik's machine of destruction, Sonic powers through it like a cannonball with his Super Spin Attack, leaving Robotnik to retreat and prepare a "bigger surprise". The animals cheer for Sonic and ask him to join their celebrations, but he declines as he is worried about Tails, whom he hasn't heard from in days. He rushes off to continue his search. Taking place immediately before the gameplay of The Revenge of Shinobi, this tale recounts Joe Musashi's infiltration of a Neo Zeed stronghold, in search of his kidnapped love, Naoko. Shinobi overcomes various traps and guards surrounding the perimeter of a pagoda (castle) belonging to the Neo Zeed, where he believes Naoko is being held. He scales the building and enters via the rooftop, surprising a relaxed group of guards and angrily demanding to know Naoko's location. The story is heavily narrated, which is used to convey Joe's motives, build a stronger sense of story atmosphere and explain how his ninja abilities work. Set between the first and second games of the series, the heroes Ax-Battler, Tyris Flare and Gilius Thunderhead find themselves threatened by the potential resurrection of Dark Guld. Ambushed by a group of lizardmen in a desert market, the heroes soon find that their attackers are led by Riga Mortis and Ul-Tima, a guard-captain and disciple serving under the necromancer Blackspell. During the conflict, a minotaur reflects Gilius' earth spell into Ax-Battler's forehead, which appears to kill him instantly. Tyris and Gilius are subdued, bound and taken to the Citadel of Dead Souls, where Blackspell reveals his plan. He has somehow stolen the Golden Axe from the Yurian kingdoms and recovered the corpse of Dark Guld; by sacrificing one of the heroes who slayed the tyrant, Blackspell plans to resurrect Dark Guld and have him lead a necromantic army across the kingdom. Gilius and Tyris plead that Dark Guld is a madman who will not follow the orders of anyone. A closing shot shows peasants deciding on what to do with Ax-Battler's body. Streets of Rage - Debuted in Issue #007. Kid Chameleon - Debuted in Issue #007. Wonder Boy in Demon World - Debuted in Issue #002. This page was last edited on 27 January 2019, at 16:14.